HOW IT WORKS - The Combimate limescale reducer treats the water chemically by using chemical spheres which slowly dissolve into the water flow as it passes through the Combimate. Reduced to only �5.00 + vat and carriage. Yearly, you will need to replace the siliphos spheres in your combimate to ensure continued protection. This refill pack contains approximately 800g of siliphos, and a new large o ring, which will be sufficient for at least two refills if the divider plate is fitted, or one if not fitted. Please remember, you need to replace the spheres even if they have not totally dissolved. On purchasing your refill, you will be issued with a Cistermiser Combimate Material Safety Data Sheet (MSDS). Usually in stock for next working day delivery. Reduced to only �.45 + vat and carriage. 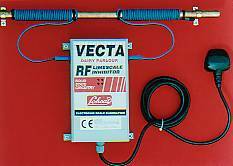 HOW IT WORKS - The VECTA RF limescale inhibitor works on the principle of radio frequency fields (16 MHz R/F) which change the molecular and crystalline structure of the lime particles in the water. This results in the lime forming soft particles, which for the main part, remain in suspension rather than normal limescale which will deposit and adhere to metal surfaces. Easy DIY installation and no plumbing required, just wind the two aerials around the water pipe, switch on, and forget. Controls to vary the intensity / frequency of the scan. Activated-carbon filter, use alone or in tandem with other filters. Particularly useful where bore hole water is in use and farm run off may lead to noxious substances entering the supply. Only �.00 + vat and carriage. Tackle scale with the same technology as our higher priced Combimate Water Softeners. Click here to be taken to our secure site to purchase your Loheat Scale Reducer online. You can also phone, fax or skype your order through to us. We usually despatch the same day we receive your order. milkingmachines.co.uk � Copyright 1999 - 2017. Web design and SEO by Shaun Wheeler. This site was last updated 02/03/2017, and features in isleofwightweather.co.uk. Part of the dc engineering [specialist dairy engineers and milking machine installers] series of milking machine websites. milkingmachines.co.uk sell milking machine spares and spare parts for milking machines. Calf feeders and animal husbandry equipment also available at calf-feeding.co.uk. Providing worthwhile milking.solutions.